Uniti CEO Lewis Horne, 34, thinks selling his nimble little electric cars will be like offering sneakers to a world full of people walking around in big, clunky clown shoes. With the UN’s October IPCC report suggesting we may have less than 12 years to radically reduce carbon emissions to avoid the worst effects of climate change, finding ways to make wholesale shifts in consumer behavior is a central premise for this Swedish startup. To make that shift over the next decade, Horne notes that hundreds of millions of internal combustion engine-driven cars will need to be removed from the roads and replaced with efficient electric ones. Be sure to watch the full interview with Horne recorded in late December in the video player at the top of the article. Uniti, which has 18 employees and is pre-revenue, is in the midst of a £30 million (about $38.1 million) capital raise, including about £1 million (about $1.27 million) available to the public via a crowdfunding campaign on UK-based CrowdCube. As of this writing, the goal has been exceeded but the site continues to accept investment pledges. The shares are being sold at a valuation of £97 million (about $123 million) even as a parallel private offering to large investors at that valuation is ongoing. U.S.-based investors must be accredited and invest at least $10,000 but investors elsewhere are not required to meet accreditation standards and may invest smaller amounts. Horne says Uniti has accepted deposits of €85 million (about $96.9 million) for its cars, which are not yet in production. The design presently calls for the first model to be a two-seater with a tandem, front and back seat configuration. The car would have a 24-kwh battery, comparable to the battery in my 2012 Nissan Leaf, but due in part to its smaller size, the car would be more than twice as efficient as a Leaf, allowing it to travel up to approximately 185 miles on a charge–somewhat less in the winter, Horne notes. The car would have a top speed of 130 kilometers/80 miles per hour. To do so quickly, Horne hopes to make the small cars in small plants that may produce as few as ten or eleven cars per day. The right to manufacture the cars would be licensed to third parties, allowing for localized distribution around relatively small production facilities. He boasts that discussions with parties in the country Georgia about such an arrangement have already begun. As the world looks to incumbent car manufacturers and more entrepreneurial startups to produce dozens or hundreds of efficient electric car models in the coming years, it will be interesting to see who the winners will be. 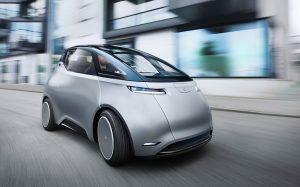 Uniti faces formidable competition. Finally, seeing the answer to the question of whether—and how fast—consumers will switch from gasoline-powered clown shoes to electric sneakers will be interesting.